When I chose chocolate as the theme for the first CBBP, I had in mind that I would contribute a recipe that everyone could make and appreciate. So, here is my favourite homemade chocolate bar. I suggest using good quality chocolate in the recipe. I used Callebaut milk and dark chocolate. Valrhona, Scharfenberg and Lindt are also safe bets. The bar is constructed in layers. The base is made from milk chocolate, praline paste, and feuilletine, which is a small crunchy wafer. If you are not able to find or make praline paste, you can use Nutella. On top of the base, milk chocolate ganache is poured. 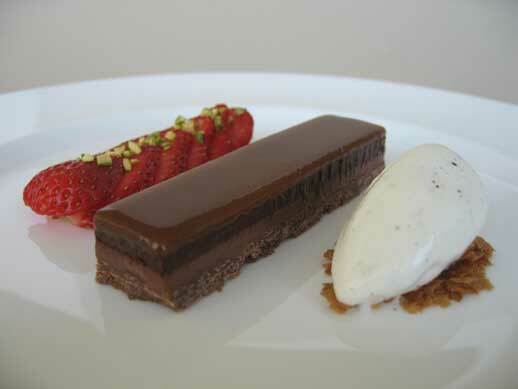 Once the milk chocolate layer is frozen, dark chocolate ganache is used to form the third layer. If you enjoy true decadence, add a final layer of caramel sauce to finish things off. 1. Melt milk chocolate in microwave for approximately 1 minute. Take out, and mix until smooth. If you still have chunks of chocolate, heat at 10 second intervals until chocolate is melted. 2. Once the chocolate is smooth, add praline paste or Nutella and mix until fully combined. Add feuilletine and mix until combined. 3. Then, pour the mixture in your sheet pan, spread evenly with a palate knife and place in the freezer for 30 minutes. 1. Make a milk chocolate ganache: Heat cream on the stove or microwave until boiling and then pour cream over the milk chocolate. Let it sit for 5-10 minutes and then mix until the ganache is smooth. If there are still chunks of chocolate, heat in microwave for 10 second intervals until it is smooth. 2. Add caramel sauce to the mixture and combine thoroughly. 3. Then pour and spread over the frozen feuilletine base. Work quickly using a palate knife to spread this mixture over the base, trying to get the layer as even as possible. Banging the bottom of the pan on the counter may help achieve a more level surface. Place in the freezer for 1 hour. 1. Make a dark chocolate ganache: Heat cream on the stove or microwave until boiling and then pour over the dark chocolate. Let it sit for 5-10 minutes and then mix until the ganache is smooth. 2. Working quickly using a palate knife, spread this mixture over the prior layers, trying to get it as even as possible. Banging the bottom of the pan on the counter may help achieve a more level surface. 3. Place in the freezer for 1 hour before adding a caramel topping. If you are not adding caramel, leave the pan in the freezer for four hours before serving. 1. Make a caramel sauce by placing 210g of sugar and 70g water in a small saucepan over high heat. Cook the sugar until the sugar turns a golden amber colour. 2. Once amber, work quickly. Take sugar mixture off the heat. Immediately add 140g of cream and stand back, as the mixture will bubble and splatter. Then, using a wooden spoon, mix until the cream and sugar are combined to make a caramel. If there are lumps of sugar that have not dissolved, return to the heat and stir until melted. 3. Let the caramel cool for 5-10 minutes before pouring a thin layer on top of the frozen bar. Work quickly, using a palate knife, to spread this mixture over the prior layers, trying to get it as even as possible. Once again, banging the bottom of the pan on the counter may help achieve a more level surface. Place in the freezer for four hours, or over night if possible. To serve, cut the chocolate bar with a sharp knife that has been heated with hot water or a butane torch. This helps achieve a clean edge. I suggest cutting small, thin slices, as the bar is extremely rich. To bring out the flavours, I recommend letting the bar warm up for a few minutes before serving. You can keep the chocolate bar in the freezer for up to two weeks, but I am sure it will disappear before then. Posted by Sam at 9:19 p.m. This looks extremely delicate and beautiful! sam - that looks fantastic! i'm a huge fan of sweet terrines and other decadent desserts. thanks for all the hard work for cbbp! Wow! This'd be perfect for Chocolate Mentoring ... helping a nine-year old whose mother doesn't like chocolate have a proper upbringing ... any ideas on where to find the feuilletine? or a substitute? Just gorgeous! Sam, you never cease to amaze me. This looks incredible, and you make it sound so easy to make at home. Truly, all I can say it "Wow!" Lucky is the person who gets a CBBP package from you! Thanks for organizing the first CBBP, by the way. Well done! this sounds like chocolate heaven! and looks like it too! Looks absolutely divine! The ultimate dessert! Thanks for your comment. The process is simple but time consuming, I normally multi-task. Your desserts look wonderful. Terrines are fun. I should explore terrines. Thanks for participating. Feuilletine is made by a company called French chocolate company called Cocaobarry. You should be able to find them on-line. For people in Toronto, they can be found at Bonnie Stern's store. Thanks for your comment and your help in getting the word out about this event. I hope the person who recieves my package, enjoys it! It is my favourite chocolate bar. It is dangerously good. Thanks for your comment. It should probably do if you have a chocolate craving. This is definitely on the must-try list. It looks fabulous! miam miam!! J'en veux! Beautifully done! On my list, et hop! Thanks, the dessert looks terrific and don't want to miss it!! Three Oh's, Wow! I hope you do try this one Ivonne. I love that you hop. I suggest ordering on-line, feuilletine is very handy. If you don't want to go that route I suggest making gaufrettes, thin wafer-like cookies, then crushing them up. Rice crispies may work, but I haven't tried it with this recipe before. If anyone else has any other suggestions please feel free to let us know. Do You want to find out more about Achieve Your Goal...then go to http://possibility123.com/Achieve%20Your%20Goal.html..
iam kyaron from nagarkot,nepal. i found your site which is very nice. I especially liked the receipe of chocolate bar. Now, i will introduce your receipe in my resort in nagarkot. Merci beaucoup pour votre plaisir sucré. Great post, thank you! Also, there is another wonderful article about French chocolate. It has some history and even recommends the best wine/chocolate combinations, which I found to be absolutely delicious. It's for real gourmets!